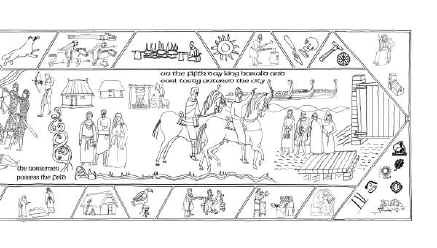 The central characters of the panel are the victors, king Harold and earl Tostig. They ride towards the city where a cleric, a warrior, a monk and a nun all display their submission. The cleric holds the keys of the city: the warrior has unbuckled his sword. They stand on a bridge at the gate of the city. On their approach to the city, the victors pass three sullen citizens. Behind them there are signs of a feast being prepared for the victors. A fat lamb is prepared to join the barbecue. The feast is set among the houses south of the city, which have not been destroyed. Along the river some longships from the Norsemen are seen drawn up on the riverbank. In the distance there is a church that dates from the time. The two figures galloping north towards York. These are the reinforcements that are also arriving at exactly the same time from the south, led by king Harold of England. His impressive banner has the head of a dragon. It is possible that this was similar in design to Roman cavalry banners which produced a wailing sound as the wind rushes through the mouth of the dragon. It is supposed to have been made for him by his long-term partner and mother of many children, Edith ‘Swanneck’. Geese are being carefully roasted. This comes from the Bayeux Tapestry. The full sun reflects the stories at the time that speak of the weather being clear and hot. The worker is hammering iron, which reflects the fact that there has been a significant amount of ironwork found on the fields of Fulford. The final images are of the archaeological work that has been conducted. The tools are the trowel, the metal detector and the soil auger. The burial was dealt with earlier. Little is known about how the bodies of those who died were disposed of. Perhaps the small group buried near Fishergate died close to the city, maybe the small group buried in the city died of their wounds or were brought back to the city by their families from the battlefield. We will never know. A large house is seen being repaired as normality returns to the area. The people of York have agreed to accommodate the invaders and go south with them in the spring to complete the conquest of England. A servant at the hospice offers food to two young widows. In the aftermath of the battle, many families will have been left impoverished and would have to rely on charity. A scribe makes a record of the events, surrounded by the symbols of the National Lottery, Local Heritage Initiative, Countryside Agency and Nationwide Building Society, which provided funding for this work. The final image is of a woman spinning the threads that will be used to embroider the tale of how the Norsemen came to Yorkshire in 1066.